This review will be on a 12V 200 Amp battery from NPP Powers. Think of solar energy systems, sometimes the need for a high capacity is needed. This is because you can not use a 50 AH battery in a 5000 watts system.for this reason, its is advisable to use the correct capacity of the battery to a corresponding size of the solar array. NPPower International Inc has seen this need and decided to manufacture a heavy duty battery. By heavy duty I mean this solar battery can not only be used with large heavy systems but can be used also on cars, ships, boats etc. The below battery was manufactured by the NPPower International Inc to give solution to solar firms, community shared solar and in our case a huge system just like in our budgets. So let’s review and see its uniqueness!! Our battery has a quite big usable capacity. 200 AH, means that with our NPP 12V 200 Amp NPL12 200Ah battery you can draw a current of 200A for one hour. But this current is high for one appliance, let’s say you are drawing a current of 20 A for your television and laptop. You can use this battery for 10 hours before it gets completely discharge. Suppose you have 10 of these batteries and regony solar panel, energy would never run out at your house. NPP 12V 200 Amp NPL12 200Ah plates inside the battery are made of a great high-quality material which is of good efficiency. Ou battery is a maintenance free battery. you don’t have to both in huge Maintainance just dusting it for cleanliness and the batter will alway work efficiently. The battery casing material is an all weather plastic material and it resists corrosion. Its applications are not limited. we can use it for various applications as we mentioned earlier above. This is the largest 12 volts you will find that can be able to last you in the light after utility power goes off. Several NPP 12V 200 Amp NPL12 200Ah are also the solution to your solar system which you ought to keep stable and charging correctively while in your are off the grid. This battery will always be the solution to a lot of energy dilemmas and trust me it is the real deal for our solar budgets. I choose it because it provided me with the capacity and the efficiency needed. 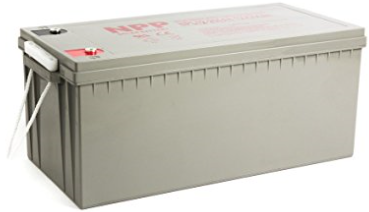 would this be a good battery for my RV? Sure this would be the ideal battery to store energy. Rarely no self discharge and much less internal resistance. It lets you use exactly what you store in it. Thanks for these batteries and suggestions.